During my first few weeks at Stockport Council I noticed that many of the key principles and methods of service design were being applied, but not necessarily identified or externalized as such. This not only makes it more difficult to demonstrate the value service design has brought/can bring to the table, but is also a barrier to teams thinking more strategically about service design approaches. It is a “new holistic, multidisciplinary, integrative ﬁeld” – Stefan Moritz, coach and consultant for service innovation, customer experience and multidisciplinary collaboration. The analogy that I find most effective in explaining service design however, is the coffee shop example by Marc Fonteijn, it goes like this: when you have two coffee shops next to each other, each selling the same coffee at the same price, service design is what makes you walk into one and not the other, come back often and tell your friends about it . (You can also watch the video here). Essentially, service design is, or can be, everywhere. It encompasses everything from how people move through a physical space, the digital interfaces they use and how the staff interact with them. However, service design in a public sector context does differ to a corporate one: people don’t choose to use our services (they have no other option), and similarly we don’t have the luxury to choose a target market. In the past this has made interactions with local authorities a ‘necessary evil’, as no one saw the need to improve the user experience. Now we are faced with these negative expectations, and service design can help us understand and (eventually) change them. 2. Why is it relevant? This question has two different answers – why service design is relevant now and why it is relevant for a council. Service design is becoming increasingly important now due to some key shifts and changes happening in our society/world today. First of all, it’s no question that sustainability is a key concern and by helping people see the bigger picture, closing loops and providing additional processes around a product (eg. a take back scheme for old phones) service design can bring about more environmentally sound solutions. As a society we are increasingly moving away from materialistic/capitalistic values, so the experiences around a product become the unique selling point, and an important way to add value- service design helps you think about and design these experiences. Thirdly, we now live in a world of society driven innovation/action, where anyone can get funding for their project via Kickstarter, co-create via open source, or organise their own protests. People want to get involved and have their say, and service design enables exactly that. It is relevant for a council because people are having great service experiences in their everyday lives (think Netflix, Amazon, Ocado etc. ), and they are applying those expectations to interactions they have with local authorities (who, so far haven’t been able to meet those). Service design helps you understand those expectations, meet needs and fine tune the experience. We also know that there is a lot of complexity within councils in terms of people, roles, systems, channels and processes- service design thinking helps you zoom out, understand those complexities and leverage/streamline them. And finally, we must mention the budget cuts all public sector organisations are facing, and how when you apply service/human-centred design principles to create a solution that works well for a citizen, you more often than not also reduce cost (e.g. digital solutions that are easy and accessible for the public and save time and money). 3. What are the key principles and how are they applied? 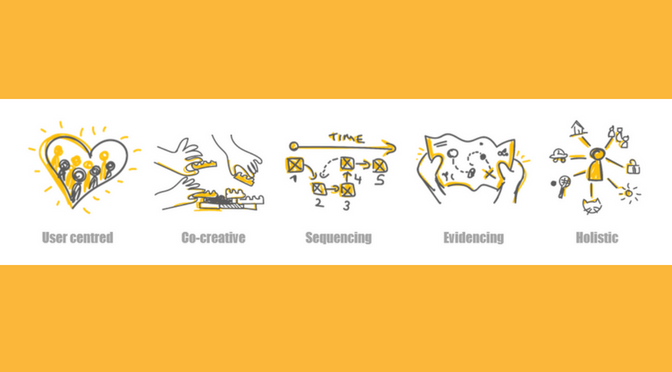 There are 5 key principles that guide any service design process, and these are rooted in human centred design, design thinking and systems thinking approaches. Other areas of design, such as UX (user experience design) share some of these principles, especially the focus on the users and their needs. User centred: services are experienced and designed through customer’s eyes. You should always put user needs first – technical/digital solutions and savings will follow. These principles are at the core of the methods and tools used to actually apply service design to a project. 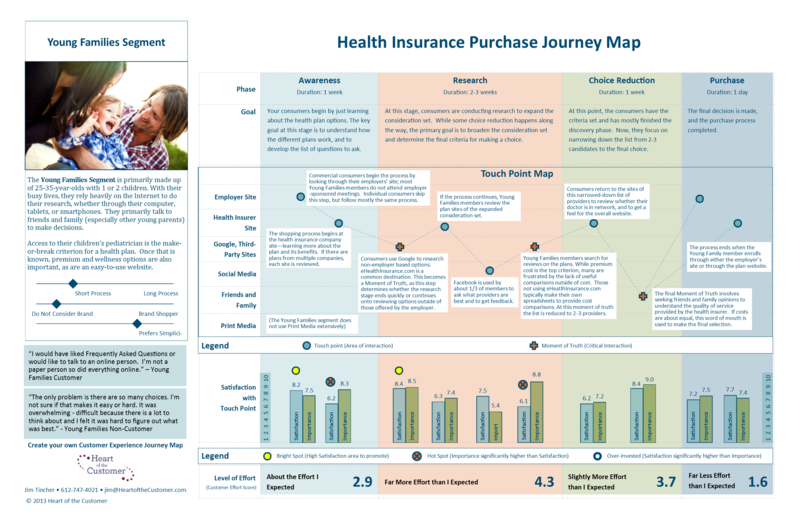 A good example is the customer journey map (example below), which can be done at any stage of the process and is an essential part of any service design. This takes us to the end of my top three. There are of course many more tools and facets to service design that make it such a valuable addition to many projects, both in the corporate and public sector. It is important to note that service design is not just something that designers can do – anyone can learn the thinking and values behind it, and apply this to the work they do. In fact, the more diverse and interdisciplinary a team is, the better a service design solution becomes. This is what we aim to do here at Stockport Council, so that our digital transformation brings about the best solutions for users, without losing sight of the bigger picture around them.